Monty Python's Life of Brian is coming soon!Sign up to be notified when tickets go on sale near you. usheru will use your email to let you know when tickets for Monty Python's Life of Brian go on sale. 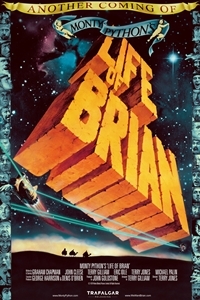 Returning to cinemas for it's 40th Anniversary, in glorious standard definition and mono-sound, Monty Python delivers a scathing, anarchic satire of both religion and Hollywood's depiction of all things biblical with their 1979 feature film Life of Brian. Highly controversial upon its original release and banned in several countries, the film is now frequently ranked as the greatest comedy feature of all time by magazines and media outlets around the world. As Monty Python member Terry Gilliam says, "It rips bare and makes you laugh at the world we've created for ourselves." 12A CertificateFilms classified 12A have been deemed appropriate for viewers of twelve and over. However, they can also be seen by younger children - provided they are accompanied by an adult who has deemed the film appropriate viewing for that child. In such cases, IFCO strongly recommends that parents/guardians make informed decisions by accessing the consumer advice available on this website.